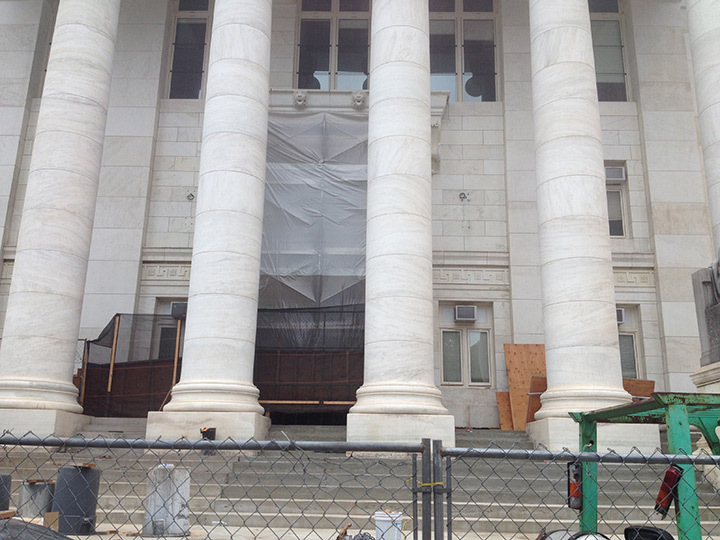 The New Haven County Courthouse is located in the Downtown of New Haven, Connecticut. 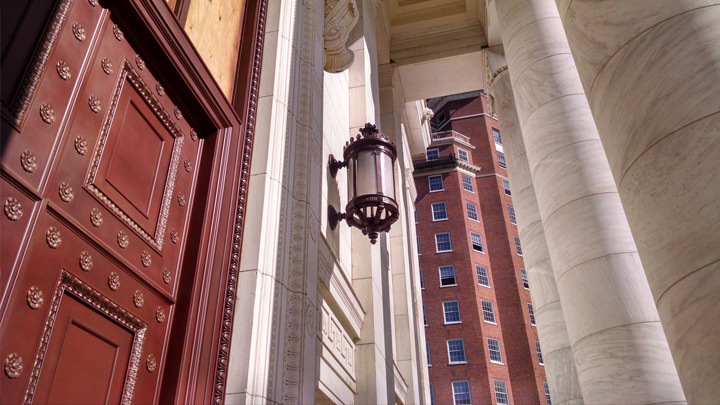 It has been a prominent and stately presence on the New Haven Green since its opening in 1914.The New Haven County Courthouse at the corner of Elm and Church Streets, was one of a handful of buildings commissioned by New Haven County to bolster its City Beautiful movement. 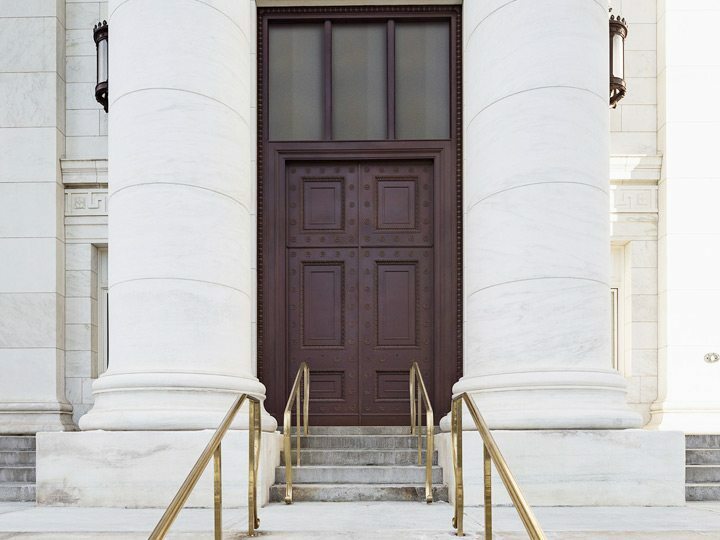 Modeled after St. George’s Hall in Liverpool, England, the courthouse was designed by New Haven architects William Allen and Richard Williams. 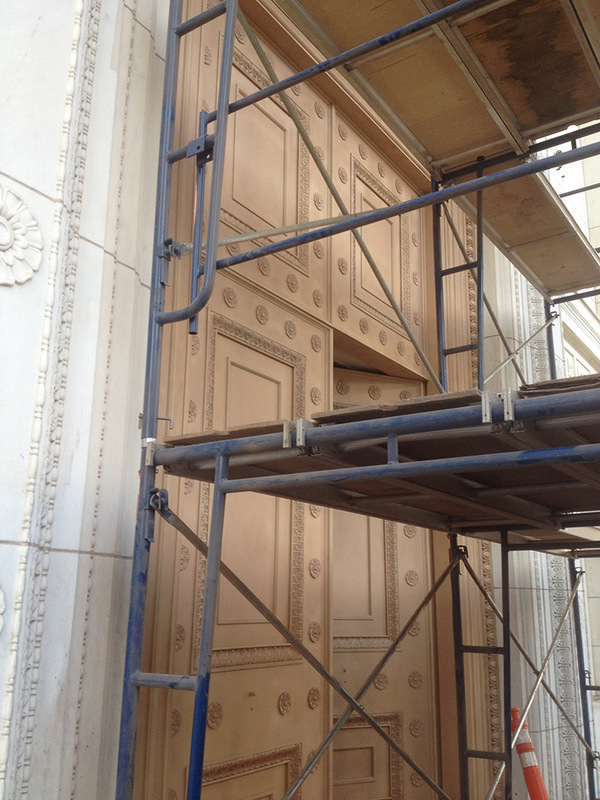 The building’s design infused Beaux-Arts principles in a Neo-classical style. 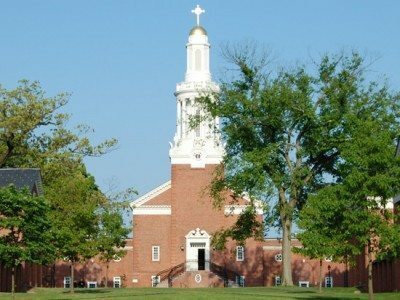 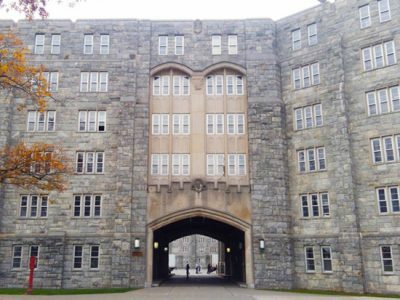 Construction began in 1909 and five years later, at a cost of $1.3 million, the structure was completed. 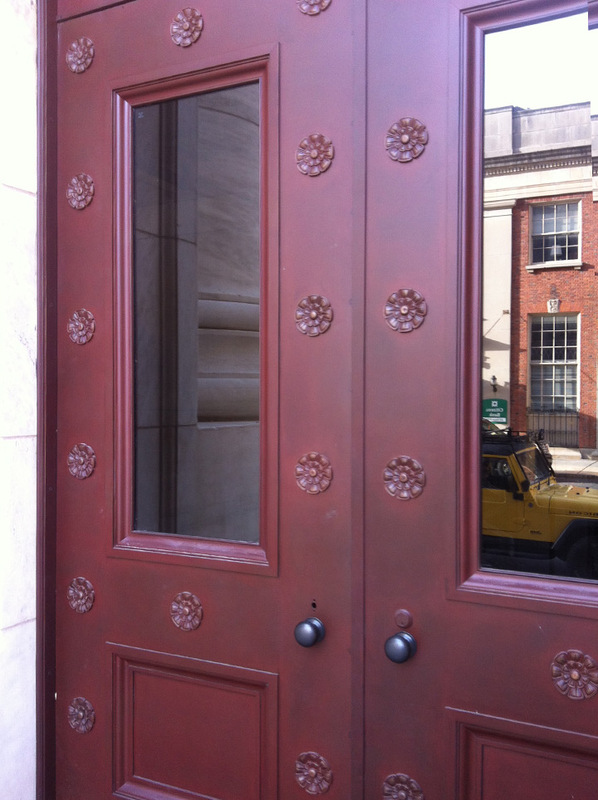 It officially opened its doors on March 24, 1914. 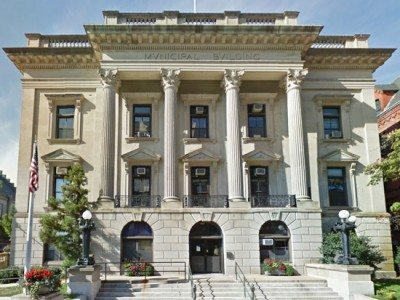 Statuary in front of the Courthouse by noted sculptor J. Massey Rhind and murals and lunettes inside by famed early 20th Century painter T. Thomas Gilbert help give the imposing building its aesthetic appeal. 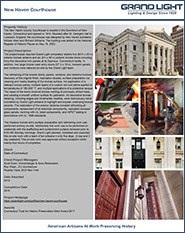 Today it serves as the Geographical Area #23 Courthouse. 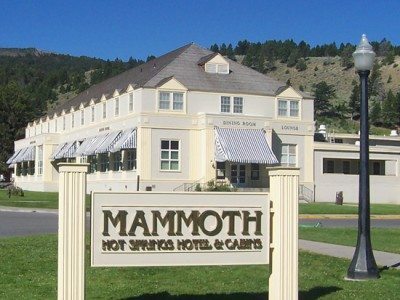 The building added to the National Register of Historic Places on May 16, 2003. 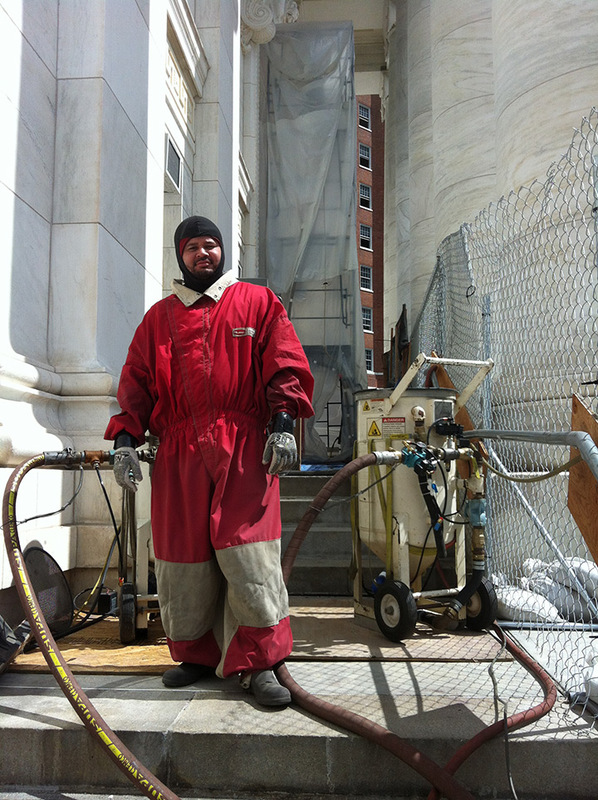 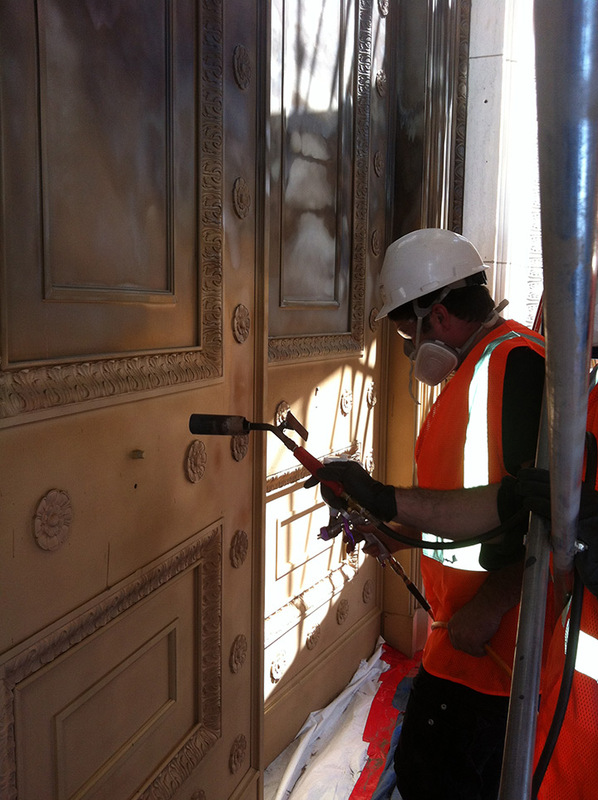 Grand Light was selected to refinish the massive courthouse doors. 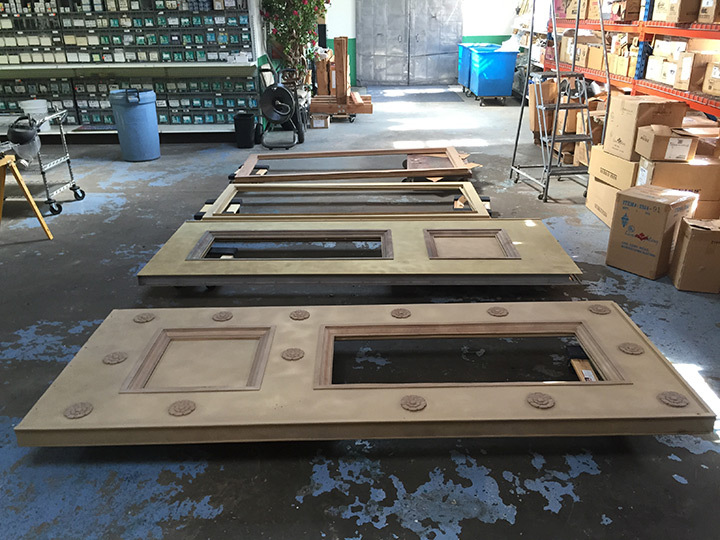 These giant cast and plate doors are over 8 ft tall and are estimated to weigh well over 800 pounds each. 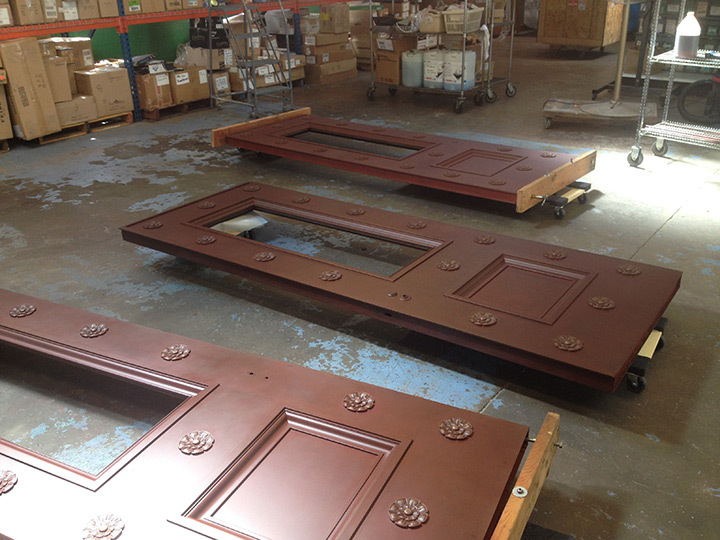 The restoration of these doors included repairing and filling holes, removing all aged finish, and an application of a new beautiful red rust patina. 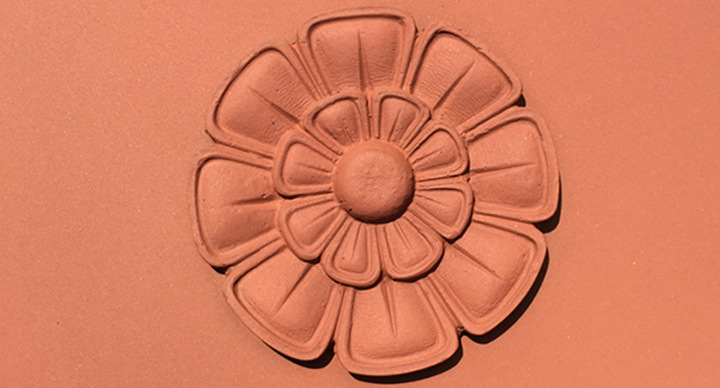 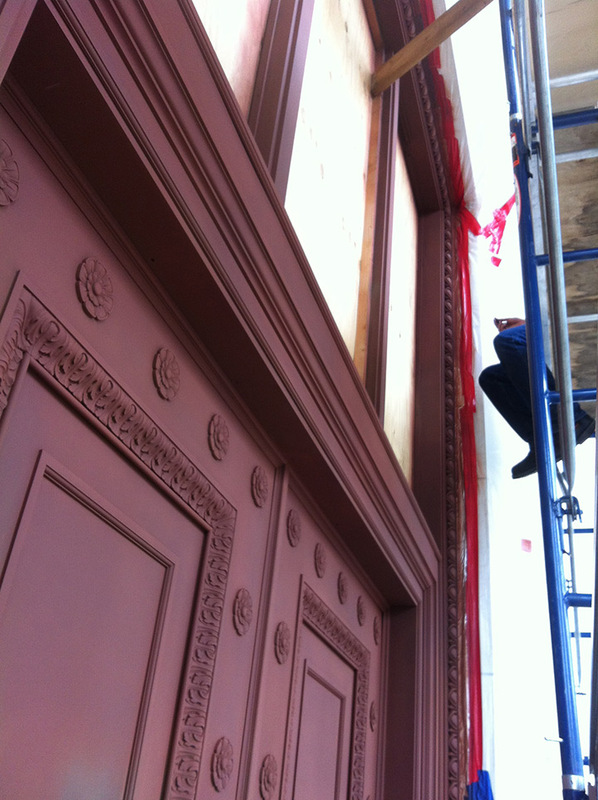 Grand Light created a special recipe to replicate the original red rust hot patina finish. 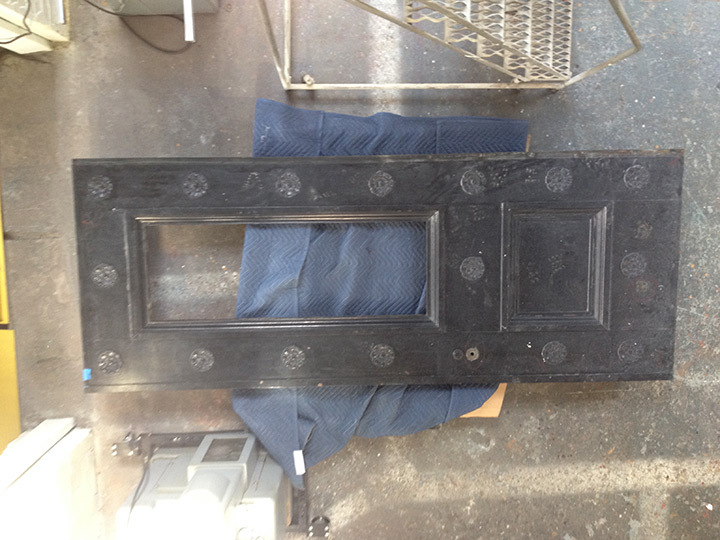 At some point, a set of the original doors had been lost when they were replaced by standard emergency push doors. 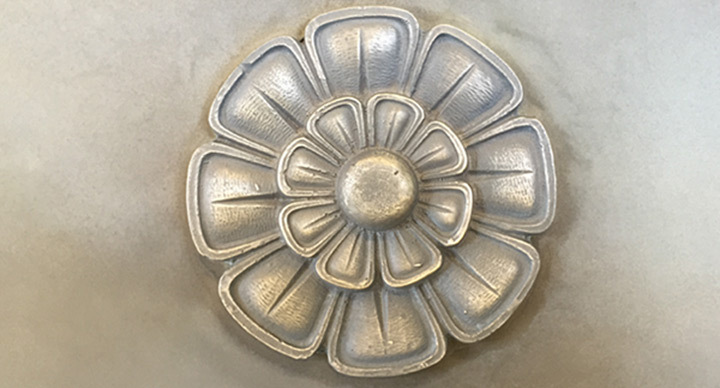 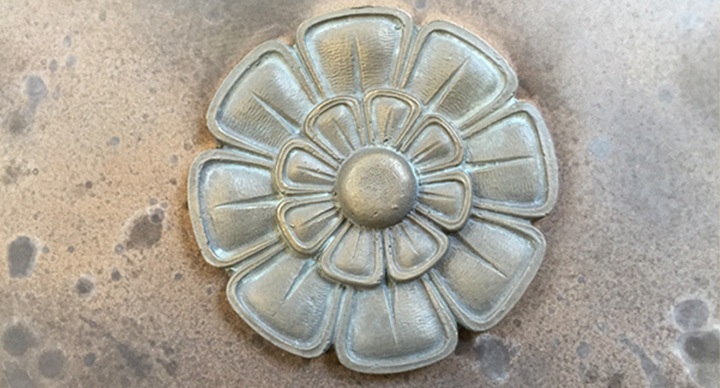 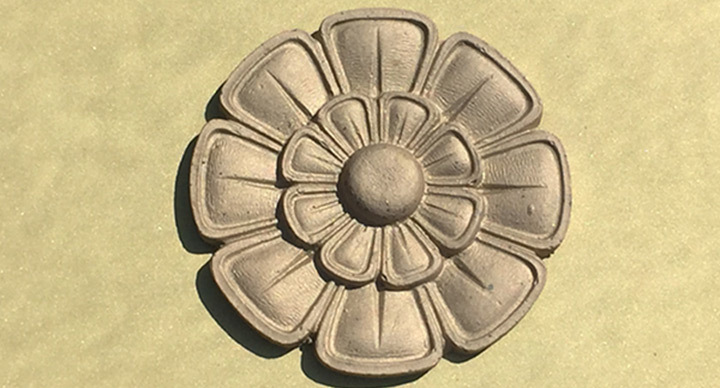 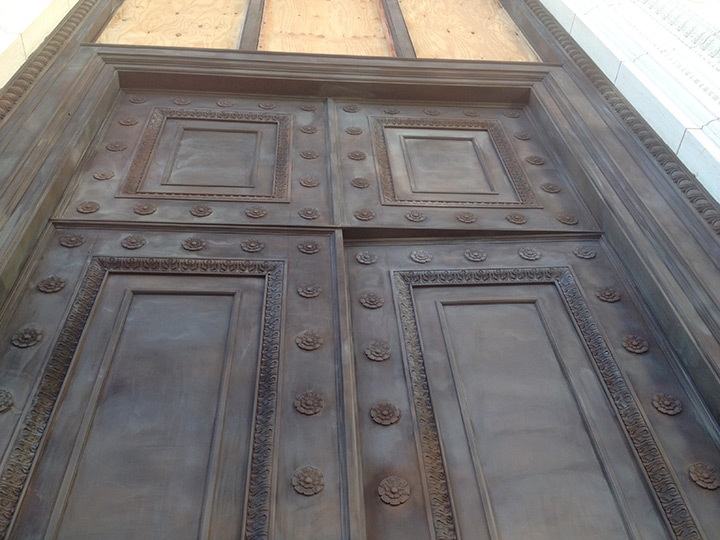 In an effort to restore the original historic appearance of the courthouse, the original cast bronze doors would need to be replaced with replications that were finished to match all other doors and exterior lighting. 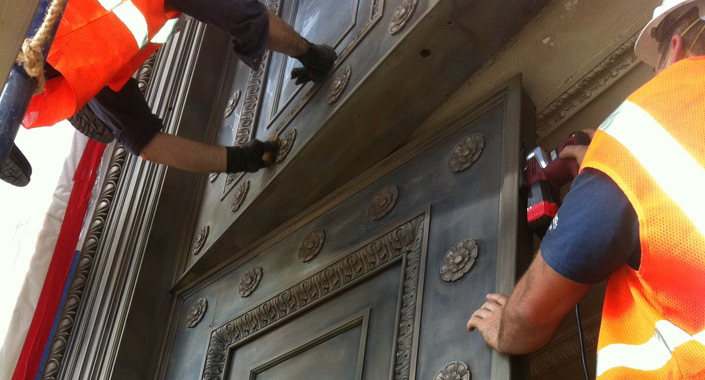 Therefore, two Church Street giant cast plate doors along with window trims were designed and fabricated to match the existing doors. 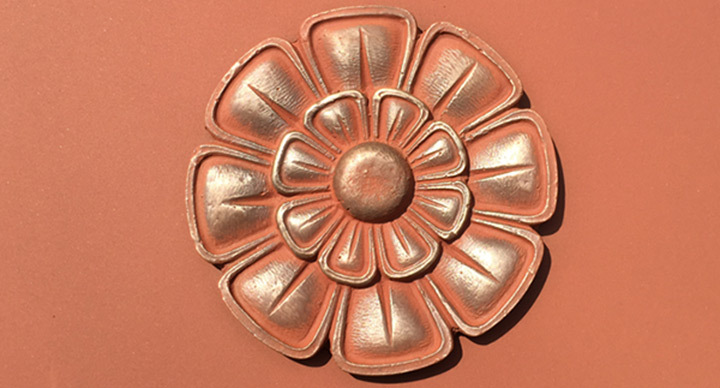 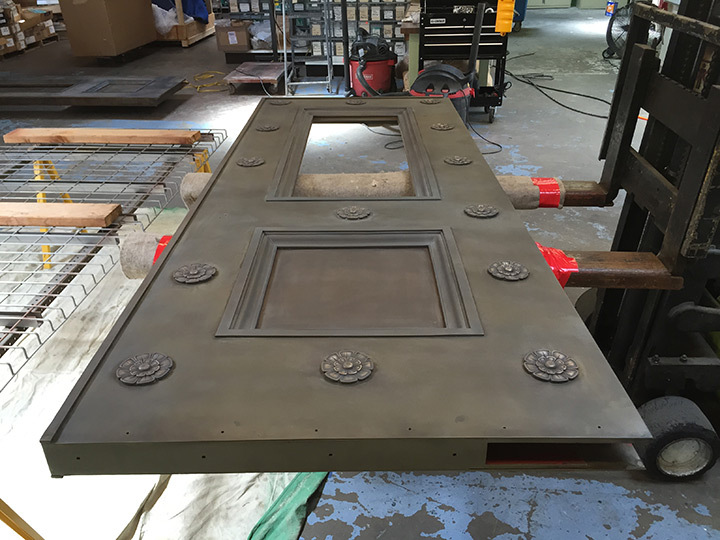 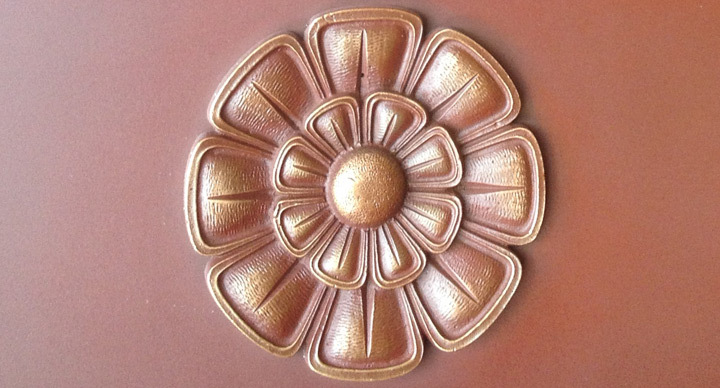 The cast bronze door replications are over 8 ft tall and estimated to weigh over 600 pounds each. 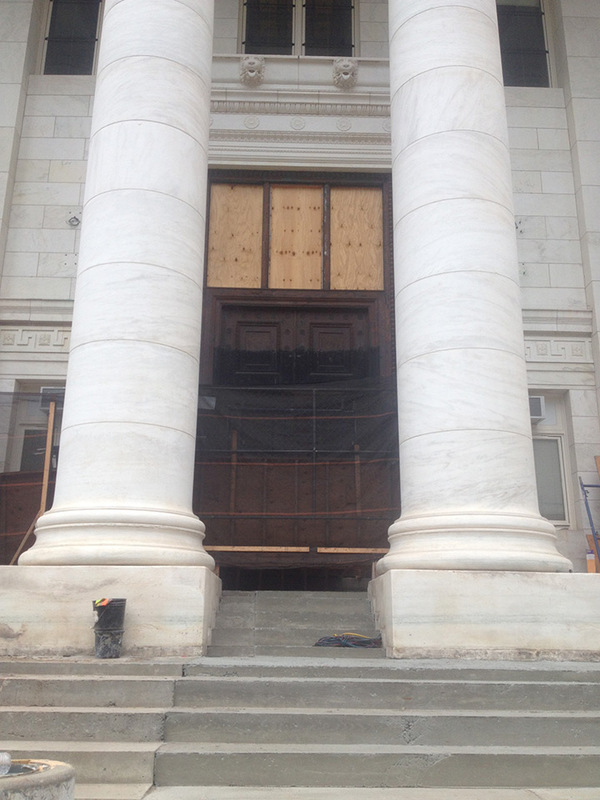 In addition to refinishing the doors, Grand Light restored large exterior lanterns from the courthouse. 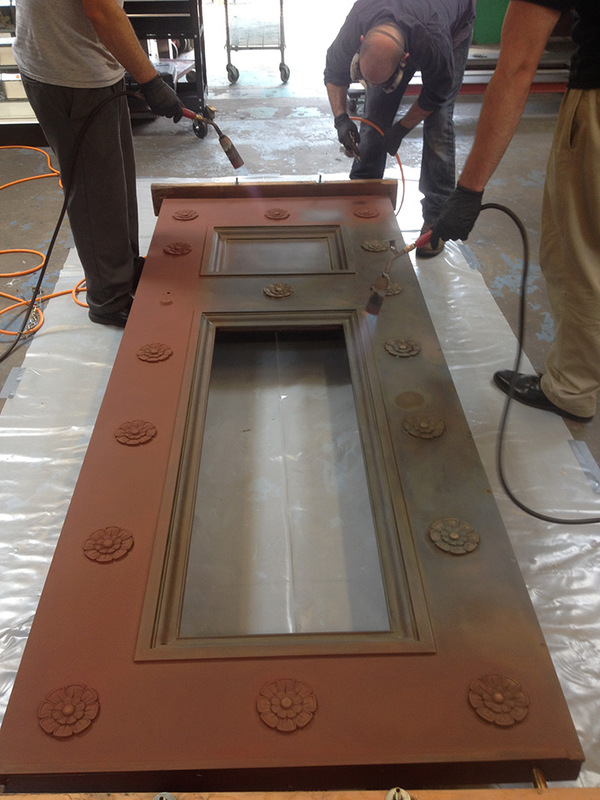 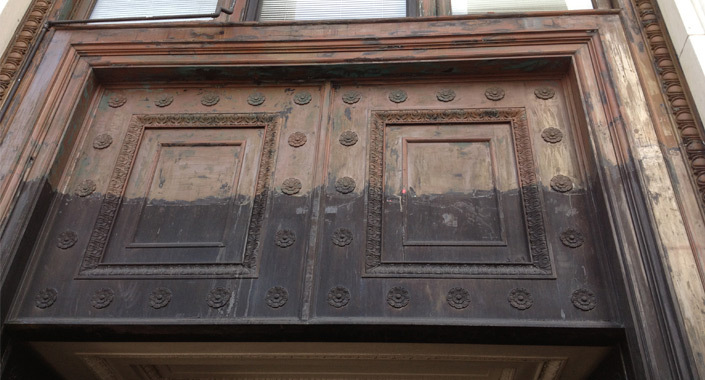 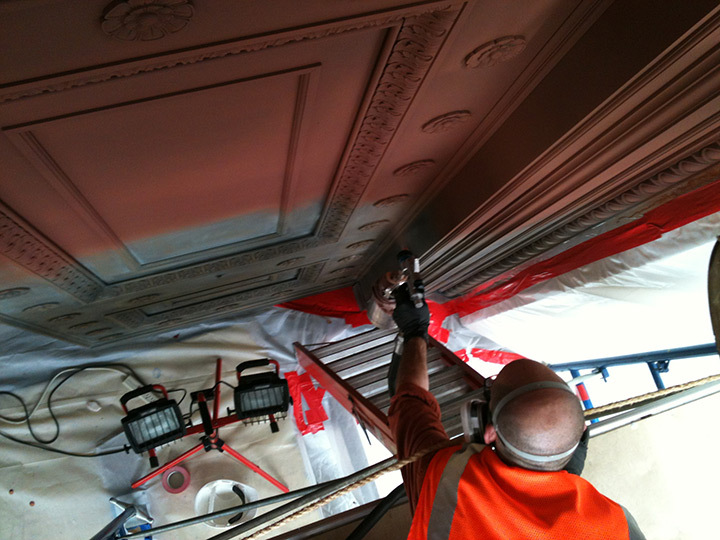 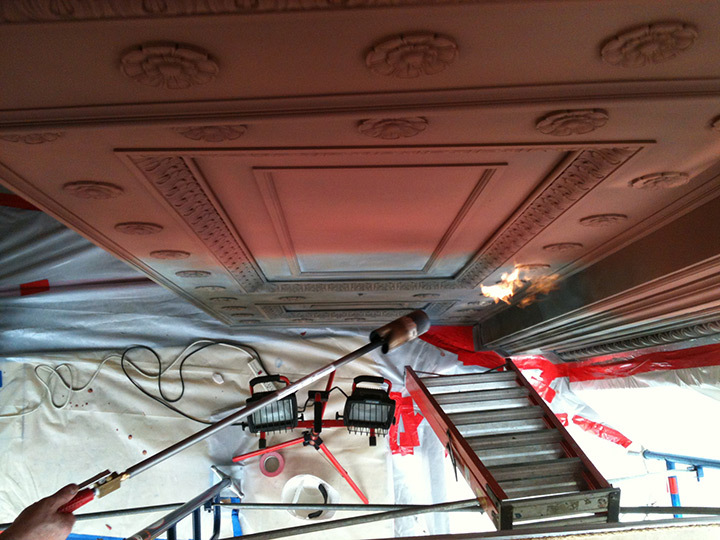 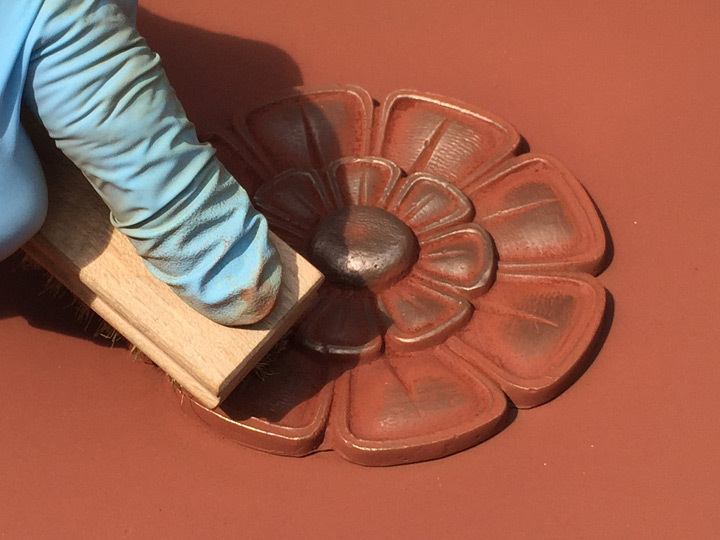 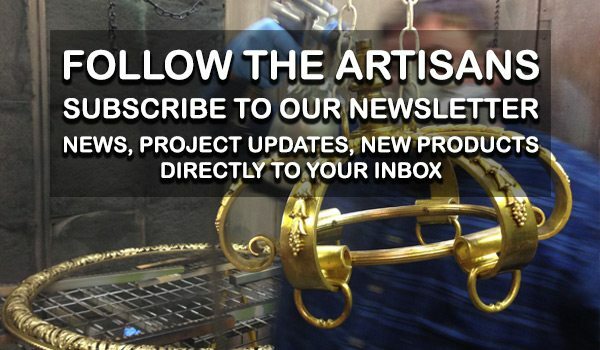 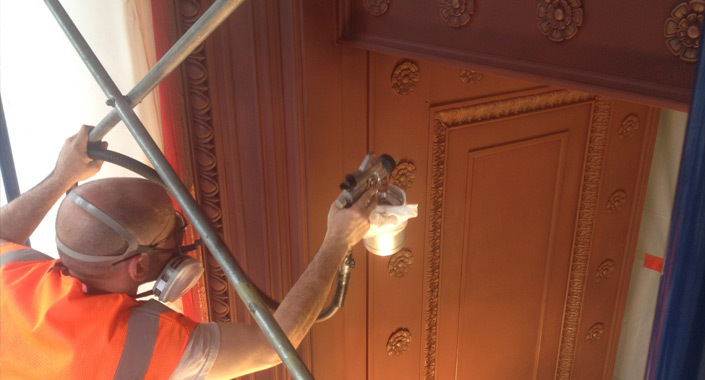 Grand Light artisans apply a custom red rust hot patina recipe, lacquer, and burnish the New Haven Courthouse Church Street and Elm Street doors. 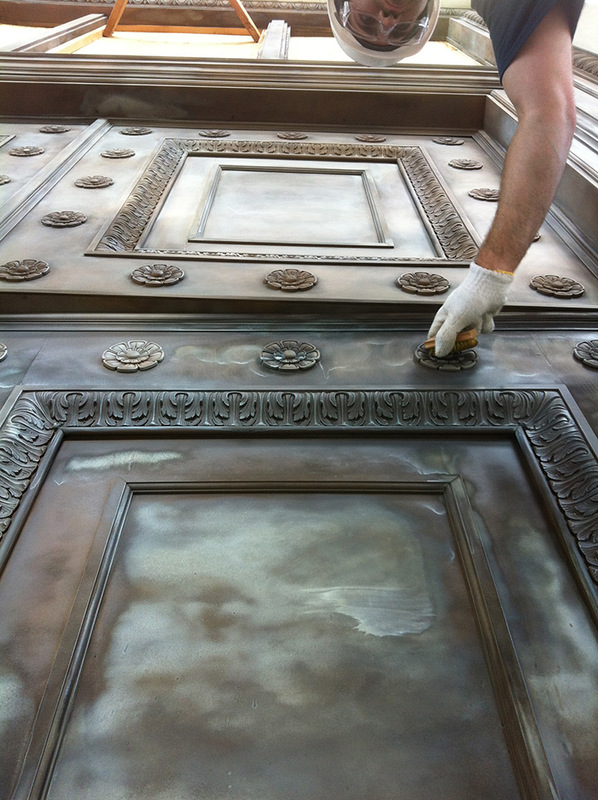 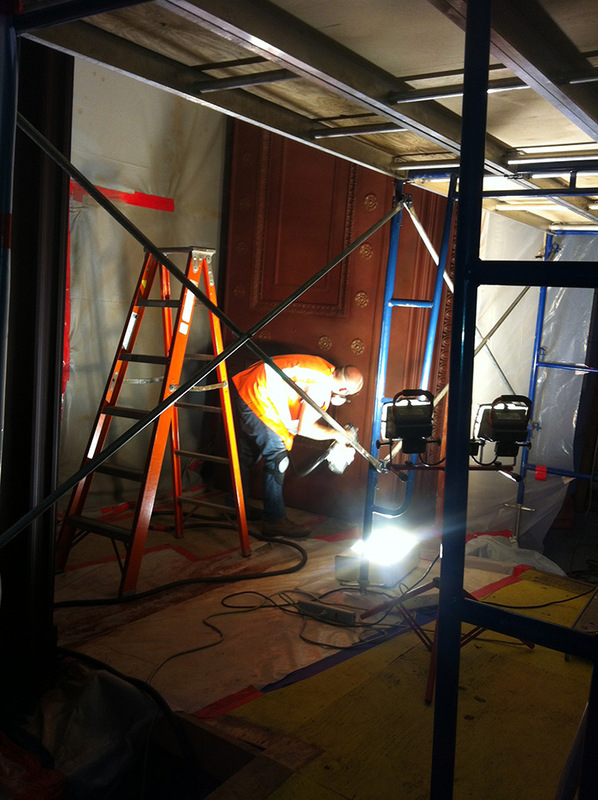 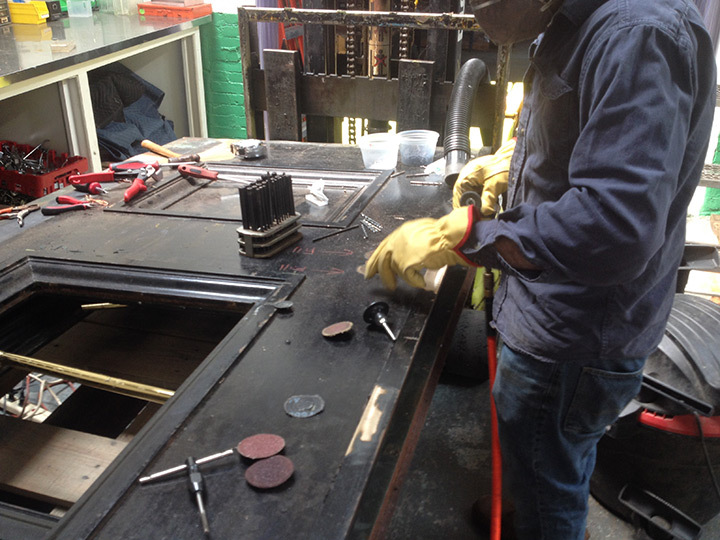 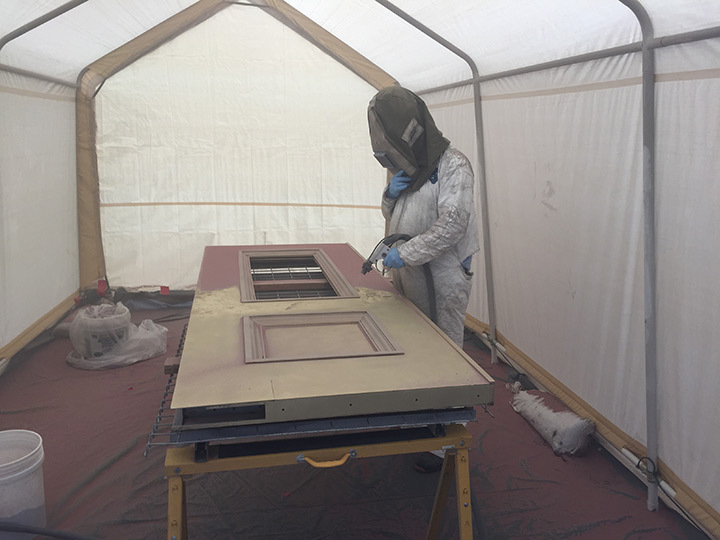 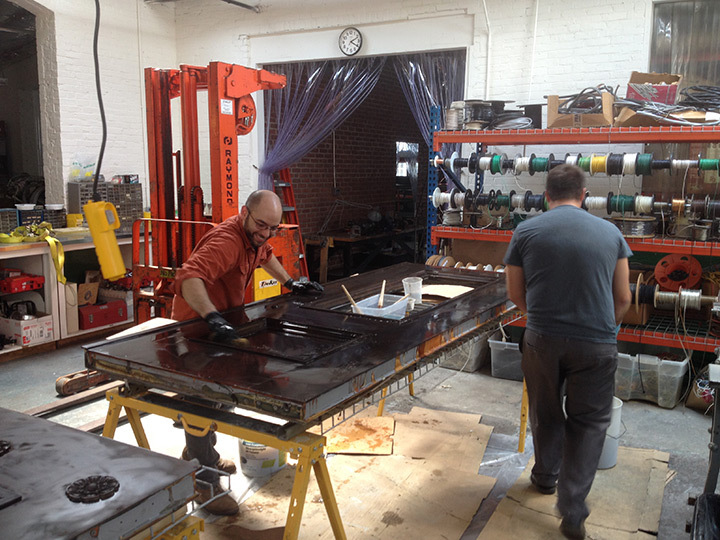 Grand Light artisans prepare the surface of the New Haven County Courthouse bronze door replications for a statuary bronze base patina application.